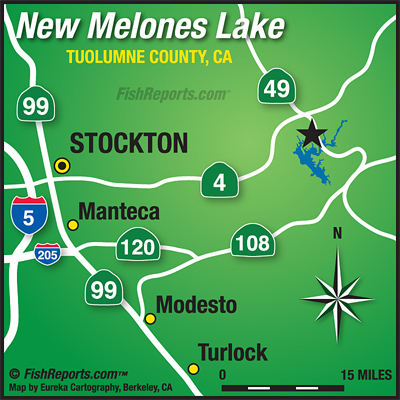 New Melones Lake level is currently at 1051.76 and 36.24 ft. from full. Water level had dropped to the year low of 1050.00 before rising to current level. Water temperature is 59 d. The lake continues to slowly progress towards turning over which will produce a better angling experience as the fish rise. The lake continued to be a bit of a tough bite for the most part in November, with single fish outings in the 3-6 lb range for anglers but December bite has improved some with Captain Jay Bone of Lockeford pulling out his stringer for us along with his partners matching stringer, all 5+ lb trout! They were using Humdingers in green, at 30 ft. depth. With the Costco trout tournament coming in January, all they would give up on location was "up river"?? Ok.
Bob Schmidt of Sacramento also brought in a nice limit of 4.1- 4.7 lbs. at the end of November. He reported using Speedy Shiners in silver/green blue from the topwater to 20 ft. deep. Bass anglers on Melones are productive using crawdad patterned jigs and plastic baits on a dropshot. Local anglers report catching 20+ bass in the 2-3 lb range using the dropshot, and switching it up to jigs for targeting the larger bass. River2sea offers the Clackin Crayfish with a hinged tail. Use this bait alternately between slow crawl, stationary and smooth steady pull, or rip it, imitating a fleeing bait. Catfish have dropped off to deeper water for the winter months. Try using a catfish dipping worm with Catfish Dip Bait in Cheese, a peg-7 sinker and soak in 60 ft. of water. Not much to report on the Crappie, the bite has slowed down.